Learning safety in, on and around the water is very important for children and parents. We offer private and semi-private swimming and water safety classes in the comfort of your own swimming pool at home or in your condo. Water is a natural and comfortable element for baby. 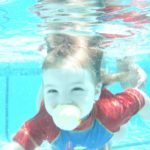 It is important for the infant to feel comfortable and safe in and around the water. It is critical to educate parents about safety at home, at the beach or at the swimming pool and how to handle their infants and toddlers around or in the water in the safest manner. Swimming and Water Safety class helps little children to become familiar, comfortable, and safe in and around the water. The Mommy and Baby Classes are an introduction and foundation for future aquatic skills and follow the American Red Cross Swimming and Water safety protocol. For children from 5 months old up to 3 years old. Drowning is a global public health problem. Most cases of drowning could be prevented with water safety education and knowledge. Miami is a location in the US where many drownings happen due to many home swimming pools and lack of education about safety with a pool.